It's almost that time again. Milan, the epicentre of global design presents its annual show in just over a weeks time (14 -19th April). There has been plenty of discussion over whether Milan has had it's day and whether other fairs are slowly making Milan less relevant but while there has certainly been a growth in the quality and popularity of other shows such as the London Design Festival and fairs in New York and Stockholm, Milan remains the mothership. Nowhere else do you get to see the very commercial and the unknown and obscure slogging it out for a slice of attention in the same city at the same time. To mark 50 years since Le Corbusier's death Cassina commissioned Jaime Hayon to create a series of small tables in homage to the great architect. Ahead of this event there are always a few new products that are previewed to wet the appetites of the design press. The selection here marks only what has come through to Design daily to date but as the momentum builds toward the event, more new designs will undoubtedly be previewed. One of a number of boxes commissioned by Porro to compliment Pierro Lissoni's Storage System. The Cabinet of Curiosities includes boxes by Piergiorgio Cazzaniga (above), Front, GamFratesi and others. This year sees the return of two new design districts in the cities centre: San Gregorio DOCET and 5Vie. Both launched last year - San Gregorio DOCET to the north and 5Vie immediately to the south of Milan's traditional design district, Brera. Joining them this year will be the San Babila district, predominantly promoted by design junction and Tom Dixon who are showing together in a disused cinema complex just minutes from Piazza San Babila. Whether this district will amount to anything remains to be seen. David Chipperfield's new collection of table and bench for E15 named 'Fayland' and 'Fawley'. There is also a stool called 'Langley'. The old alternative design district Tortona continues to limp along, kept alive in recent years more by Moooi's spectacular installations rather than anything of quality brought to the party by the organisers. There are still pockets of interest in this area supplied by individual companies and organisations such as Via's France Design and the Dutch event Tuttobene but time is running out as young designers move to Ventura Lambrate, the city's newer and far more alternative design event held to the north of the city in another former industrial area. Swedish designers Front are launching a new table called 'Elipse' for Porro. 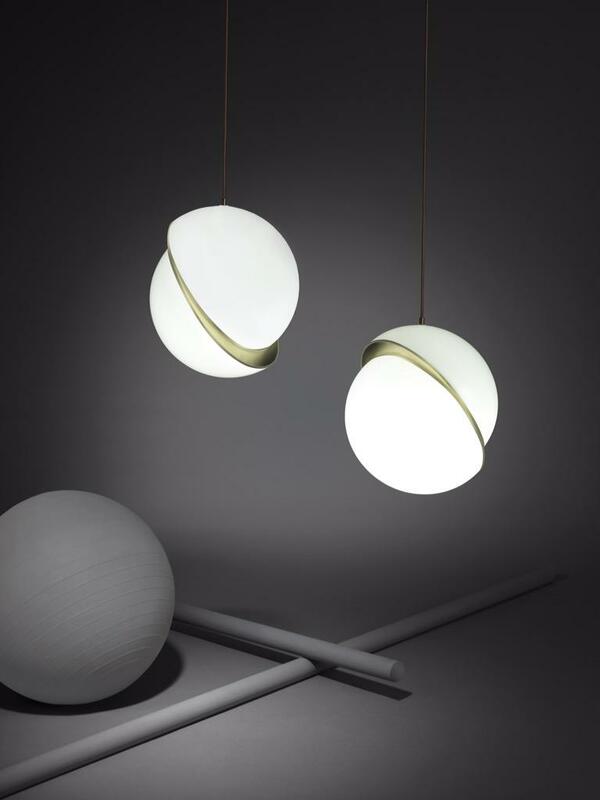 Lee Broom is just one of the big names showing at San Gregorio DOCET. This year the prolific Brit will be launching 20 new products including the 'Crescent' lights and 'Hoop' hanging chair shown below, as part of his event called The Department Store. Other exhibitors of note in the San Gregorio DOCET district will be Wallpaper* Handmade, , SCP, Emeco, USM and Kvadrat along with the limited edition galleries Brand New World from Zurich and the Milan based Le Clettico. The old design district Brera seems to be back in fashion with several key events happening there this year including the Garden of Wonders: A Journey Through Senses - an outdoor installation in the gardens behind Academy Brera. Organised by the BE OPEN Foundation, the event will showcase interpretations of famous perfume houses by a number of the worlds most interesting designers including Front, Nendo Dilmore Studio, Jaime Hayon, Piero Lissoni and Humberto Campagna. The Bouroullec's will be launching their 'Belleville' table and chair for Vitra. Injection moulded plastic rarely looks this good. Another exciting event will undoubtedly be the Daikon sponsored installation with Fabrica, curated by Formafantasma (with Fabrica's Director of Design, Sam Baron). Fabrica events are always thought provoking and beautifully executed and in the hands of someone as talented as Baron the general theme of 'air' will undoubtedly be taken in some amazing new directions. Nendo seems to always make a splash and this year he his own solo show in Brera. These are his new 'Soft tables for Glas Italia. On the fringe of Brera will be the solo show Nendo Work 2014-2015 at the Museo della Permanente. By all accounts there will be over a hundred pieces of Nendo's work from the last 12 months or so including a large display of his work for Glas Italia - one of these, 'Soft', is shown above. The 'New York' armchair by Sergio Bicego was a big success for Saba Italia in 2013 and that can only mean one thing - a follow up sofa. Piero Lissoni must never sleep. Here are his 'Lochness' cabinets for Cappellini. Ron Arad has reworked his 'Glider' sofa for Moroso from 2013. The form is now far more rounded and soft. In the 5Vie district Italian furniture lighting and accessories brand Seletti, will be launching a new table and chair design by Dutch designers Studio Job called 'Industry' and British designer Max Lamb is exhibiting his work as a large installation under the name Exercises in Seating. 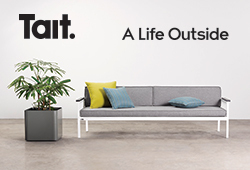 Other events include the Museo del Design 1880-1980 exhibition and Re-inventing Shoes that presents 3-D printed shoes by designers such as Zaha Hadid and Ross Lovegrove..
'Industry' is an outdoor setting cast full of bold icons by Studio Job for Seletti. Photo Studio Badini. Studio Job's 'Industry' table top shows the delicacy of the casting and the range of motifs incorporated. Back at the humungous fairgrounds at Rho, on the outskirts of Milan there will be literally hundreds of brands (989 Italian and 374 foreign companies in 2014) that run the gamut from luxury to low-cost commercial. Of these the big established brands such as Minotti, Molteni, Poliform and Porro always deliver amazing, immaculate stands while brands such as Vitra deliver original and beautifully styled room sets that are heavily shared on social media. The chair shown above is by David Lopez Quincoces, one of Piero LIssoni's recent discoveries for Living Divani. 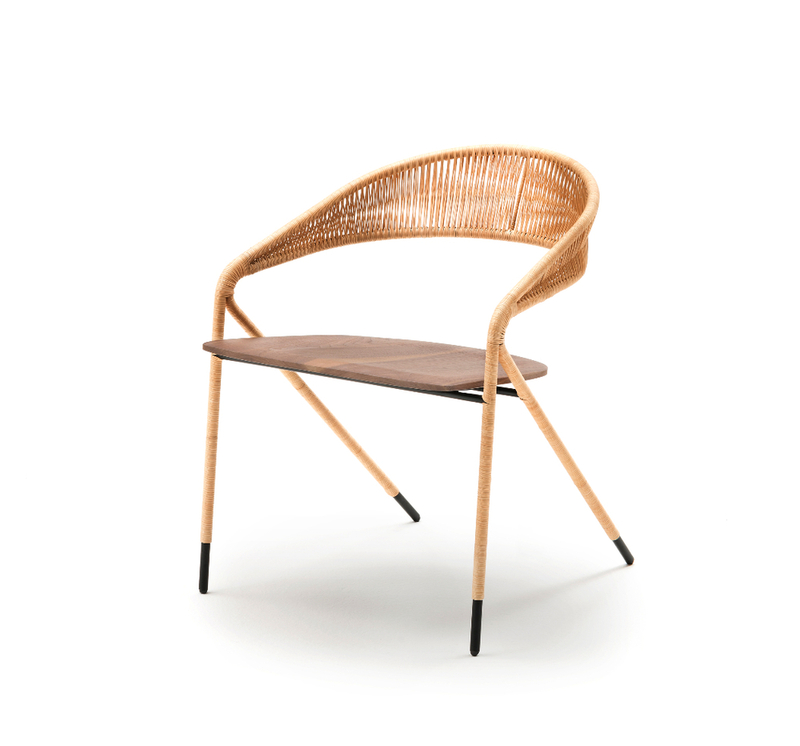 The 'Georges' chair is a beautifully fine animal in walnut and cane or in iroko and synthetic cane for exterior use. 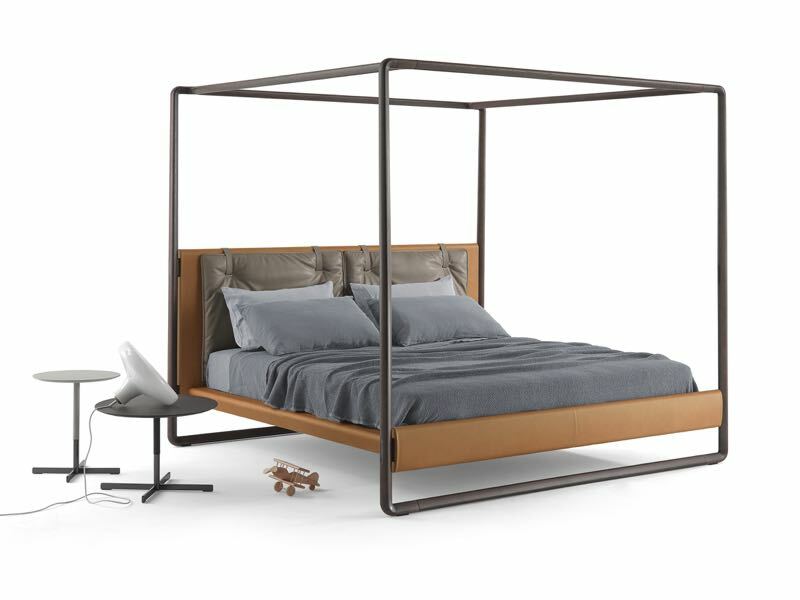 The 'Volante' bed by Roberto Lazzeroni for Poltrona Frau. All chocolate stained oak and tan leather. 'Monolite' tables by Massimo Castagna for Henge. The 'Delfino' chair by Erberto Carboni is one of Arflex's many classics from the 50's but will be shown in this plaid fabric for a completely new look. The 'Kanji' table by Francesco Rota for Paola Lenti. The table features removable glazed ceramic inserts. Young German designer Thomas Schnur has been a regular exhibitor at SalonSatellite in recent times. This year he's showing at Ventura Lambrate as part of Another Perspective. Photo Alexander Böhle. Nodus will be presenting a new collection of 5 rugs by Raymond Sesma called Unidad Transversal. Barber Osgerby's new swivelling armchair design for Knoll, consisting of just four parts. Of course 2015 is the official Year of Light and also marks the return of Euroluce (held every second year), to Salone del Mobile. Of the 24 halls utilised by Salone del Mobile, 4 will be dedicated purely to lighting. When you consider that each hall is like a giant aircraft hanger, that is a hell of a lot of lights. Here is a very small selection of some new ones that will be on show both at Euroluce and at other locations in the city. 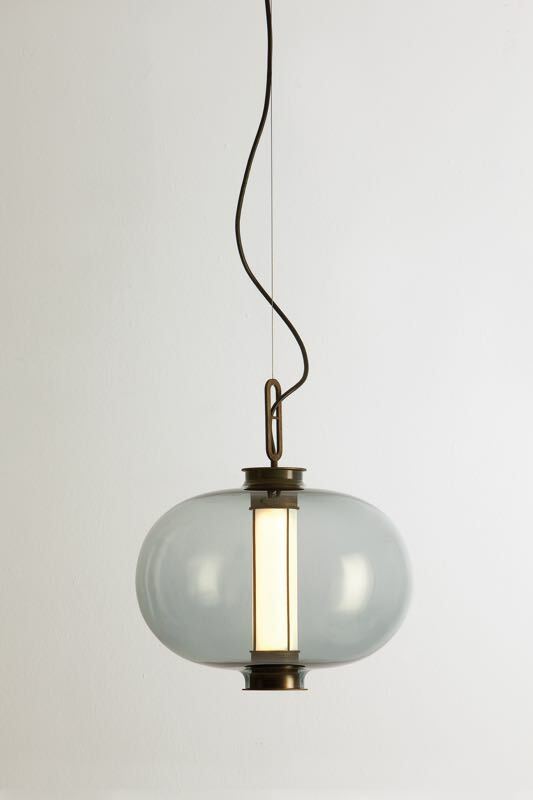 The 'BAI Di Di' 5 light chandelier by Neri & Hu for new Spanish lighting brand Parachilna. Daniel Rybakken with a prototype of his 'Stochastic' pendant light for Luceplan. A close-up look at the amazing seemingly liquid glass pendants called 'Melt' by Front for Tom Dixon.